Let’s start with this specific category of people. For the last 3 years, I have managed to lead two innovation labs, one of them was closed because of corporate politics and the second one is a 200 people growing company with operations in 6 countries. Both of them were founded in Munich, both are well funded and both have a variety of talented people involved, the only difference between them is the belief. The belief of stakeholders in success. In case of the failed one, the board members did not have enough patience to believe in success and were affected by internal non-believers who were proactively shifting the innovation lab to stop seed investments and sign off the large tickets as a VC. In case of the second one, we as board members had enough patience and skills to drive it forward to the level that we started reaping the results and generated the first spin-off – Scylla. In case of the first category, it’s usually an unhealthy mix of early-stage investment fear accompanied with corporate politics and personal ambitions, whereas in case of the second a gap of understanding of corporate goals and environment. The second group is the people who support corporate innovation, understand that the change in management style and mindset takes time and effort. It’s a steep and long path which requires the support of primary stakeholders in the company. We all know that people like to stay in the comfort zone and especially in western societies people are so afraid of uncertainty that sometimes corporate innovation becomes a fierce political battle inside and outside the organization. Worst case it could affect factors such as strikes by working unions and even in some cases harsh publications by conservative journalists. Corporate innovation labs are created from the necessity of the changing market and already happening the industrial revolution which is affected by the rise of AI, Robotics, and IOT. Operational environments are being changed and disrupted, technological advancements bring the huge and conservative organizations to the one and only viable choice – ADAPT OR DIE. These fierce competitive conditions are creating a high pressure for corporate decision makers which seek new revenue models and constant revenue diversification in the environment where shareholders demand security and growth for their investment. So not a surprise that innovation departments and especially chief innovation officers are seen as Messiahs who will save the company and skyrocket the ROI for shareholders in the shortest available time. Such a high demand and ever-growing expectations create a necessity for innovation departments to seek external help from industry experts. One of the logical moves for companies and their innovation departments is to reuse the data they have gathered through several decades of extensive worldwide operations and create new business cases from that data. Data is the most obvious choice for the companies – they do not need to establish new manufacture operations, they can improve their customer experience and make smarter decisions based on the data they have. But the most precious aspect of existing historical data is that one can enable completely new business line which was not possible in pre-AI age. This is where my job starts and where I help innovation departments understand their data, brainstorm new ideas and test completely new ideas by forming prototypes and eventually data-driven products that improve the existing new revenue streams and enable new ones. I am definitely part of the second category. I have worked in the corporate innovation, know the ins and outs of corporate decision making, plus me and my team had a pleasure to grow from a startup and face all difficulties startups face nowadays. So if you name it – we are a hell mix of a startup and corporate mentality. And remember one thing – the corporate innovation can be tricky, but it can transform industries and improve the lives of billions of people, who are consuming corporate products on an everyday basis. So I strongly believe the job we all do with you has a future. 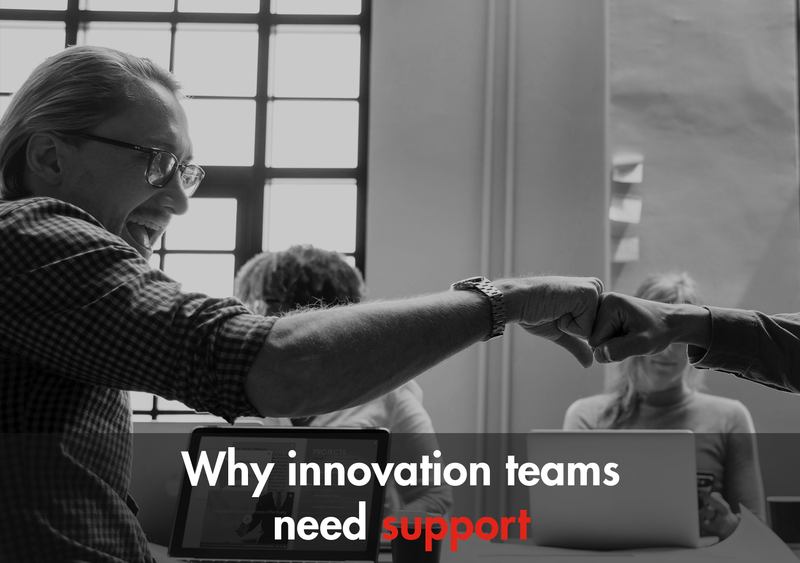 Corporate innovation departments need our support and need help both inside and outside of organizations. And only with that support, we will get the services and products we all as consumers dream about.